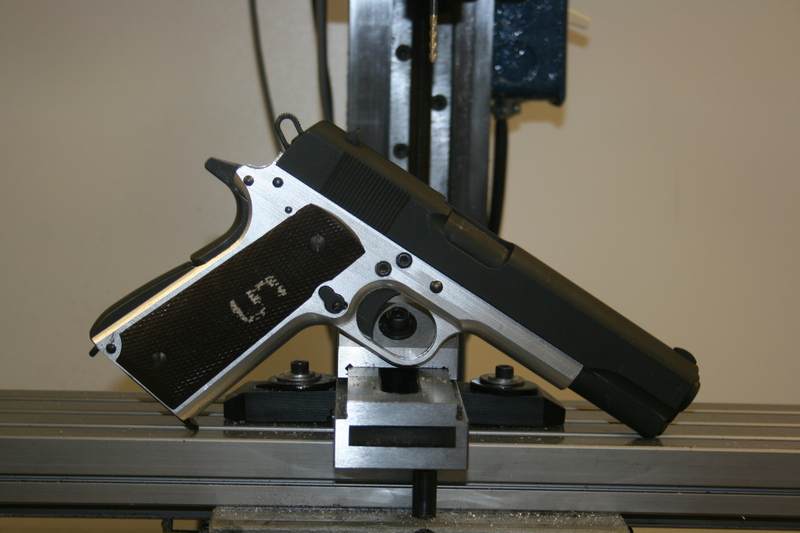 So How’d that CNC 1911 Actually Work? I should note that Jason was TCWing to keep his hand away from the ‘splody parts, should something go badly wrong. I couldn’t help making the joke in the video. I expected it to go bang, but I didn’t figure we’d empty the 50 round box of .45 without trouble, given how much frustration went into fitting it, and given that it was a cheap parts kit. Seriously, the magazine looked like it could have been manufactured near the Khyber Pass. 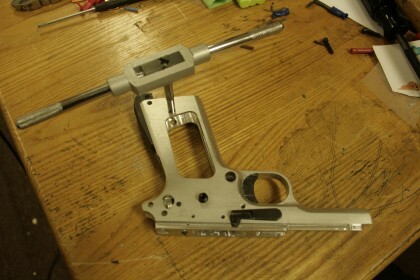 Jason brought his 7 year old daughter along, because good parenting should involve stoking your children’s curiosity about experimental home firearm building. Jason brought his .22LR AR-15 pistol along to keep the girl amused, and I do have to say she’s an excellent shot! I had never considered the utility of an AR-15 pistol for teaching kids, but it works a lot better than you might expect. It’s long enough that muzzle discipline is easy to enforce, like a rifle, but you don’t have the issue of badly sized stocks. She also seemed to do quite well with the EOtech sight. But aside from that, while it wasn’t the most accurate 1911 I’ve ever fired, it certainly did well enough for a 1911 that cost a few hundred bucks. The project still isn’t totally complete, since he plans on attempting home anodization, which apparently involves a nice bath of acid, a high voltage power supply, and a wife who is remarkably tolerant about what you are doing in the kitchen. The 1911 frame I made on the CNC machine has been sitting on my workbench for way over a year now. I decided that over Thanksgiving vacation I would finally finish the gun. 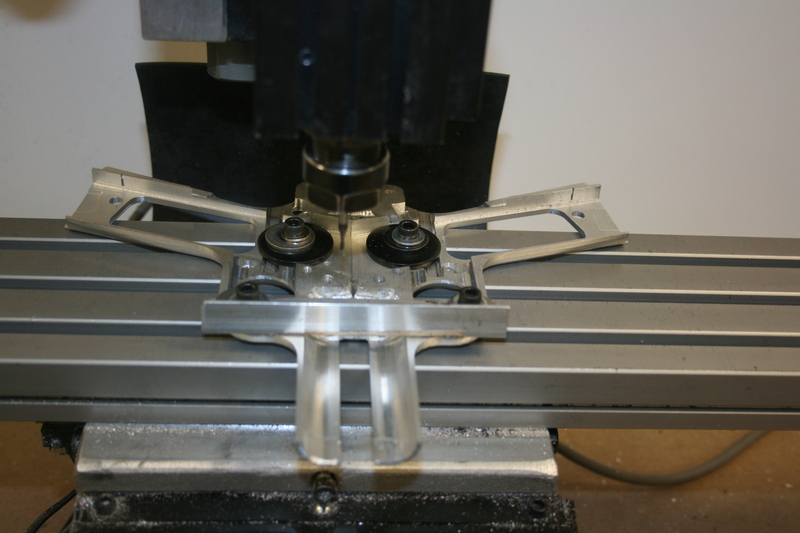 I only had a couple of small machining operations to do on the top of the frame and then it would be finished. 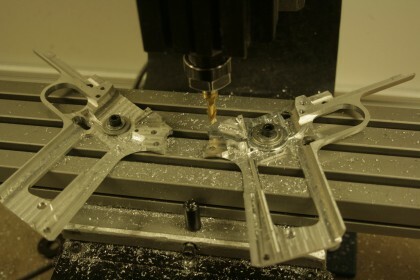 When I made my own AR-15 lowers, once I finished machining the lower receivers according to the CAD model it only took 10 minutes or so to install the parts. I figured I would be able to finish up the frame on Friday, and by Sunday, I’d be ready to go to the range. It turned out to be not so easy. The first problem was that the slide didn’t fit. The slots in the frame weren’t deep enough. After milling out the slots a bit, I was able to fit the slide. Next, I tried fitting the barrel. With the barrel and associated hardware installed, the slide wouldn’t move. 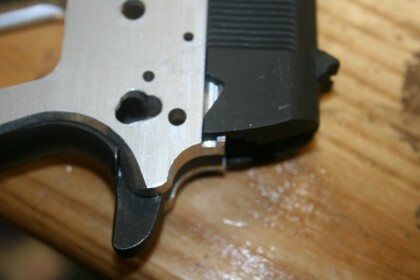 As the slide is pulled back, the barrel wasn’t lowering enough for the upper barrel lugs to unlock from the slide. 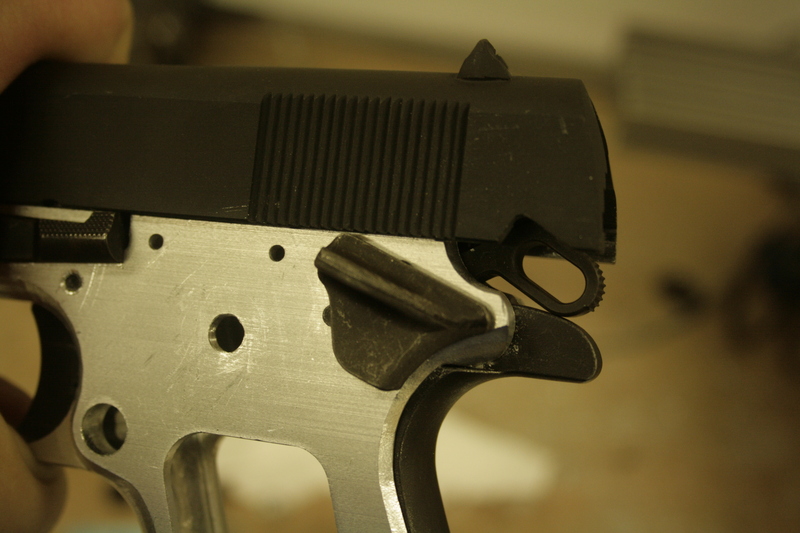 I needed to remove some material from where the bottom barrel lugs hit the frame. From what I can tell, this is normally done going in from the front of the frame with a really long end mill. 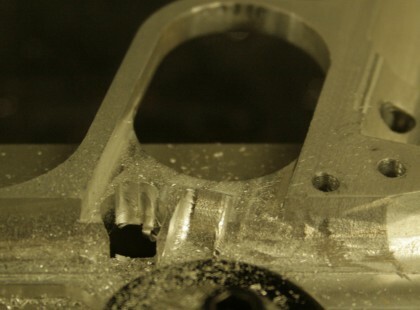 I don’t have an end mill that long, nor is there enough clearance on my mill to use one on a 1911 frame. 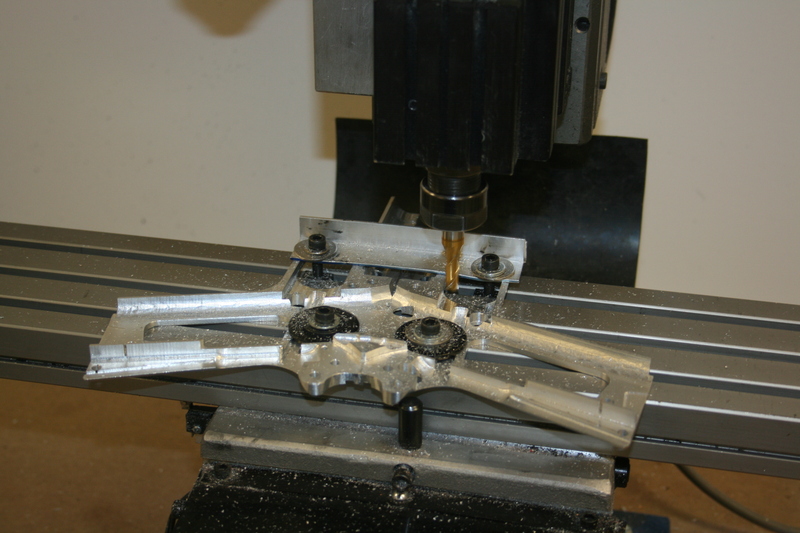 But since I had made a two piece frame I was able to unbolt the halves, lie them flat, and go in from the side with a small end mill. The trick was to remove enough material so that the barrel would go low enough, but not so much that the barrel’s rear motion is stopped by the barrel link. Now the slide and barrel move like they should. But, with the chamber all the way closed, the slide sits a little forward. 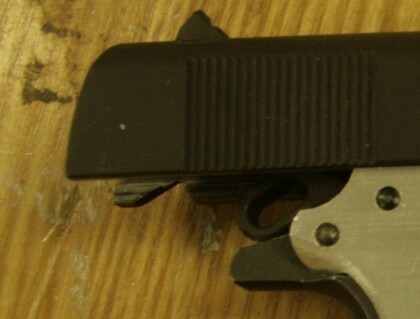 Either the slide, barrel, or frame is slightly off somewhere. I can’t think of an easy way to fix it. It doesn’t seem like it’s going to affect the operation any, so I’m going to leave it as is. 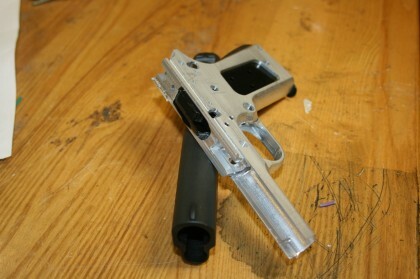 Next came the trigger, which, like the slide, didn’t fit at all. 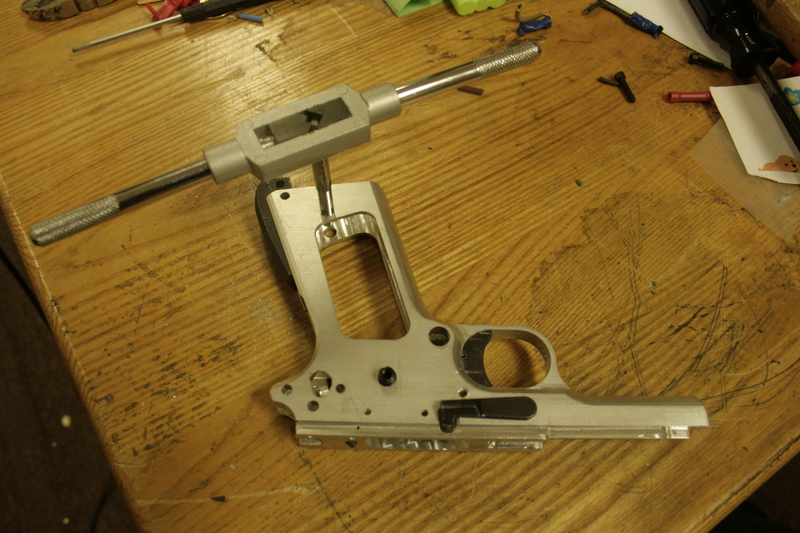 I had to widen the trigger area, again made easy by the fact that the frame can be split into two halves. After the trigger came the magazine catch, which also didn’t fit. I had to hand file the hole until the magazine catch would drop in. I then discovered that the CAD model I used was missing the slot for the magazine catch lock. I also don’t have any undercutting end mills, so having the slot in the model probably wouldn’t have helped anyway. Since the magazine catch lock is always held against one side of the slot by the spring, I decided to cut a notch from the inside of the frame down to the depth of the slot. It’s at the point that I almost ruined the frame. I was making the cuts “manually” by using the keyboard to control the mill. While doing so I brushed against the touchpad that I use for a mouse. What I hadn’t realized before is that the touchpad was configured for tap-to-click, so the touch registered as a click, and the mouse pointer happened to be sitting on the feed rate slider. So the feed rate suddenly went from 0.3 in/min to 60 in/min, and the mill went all the way through the frame and almost into the mill table. Luckily the place where I drilled through isn’t where the tab on the magazine catch lock normally sits, so while the hole doesn’t look all that nice, the magazine catch is still functional. With the magazine catch installed, I tried to insert a magazine, but it didn’t fit. I had to widen the magazine well. Now, it was time to install the sear and disconnector. The sear was too wide to fit in the space for the fire control group, so the frame is split and back on the mill again to widen that area a bit. With the fire control group area widened out, the sear, disconnector, and hammer all fit nicely. 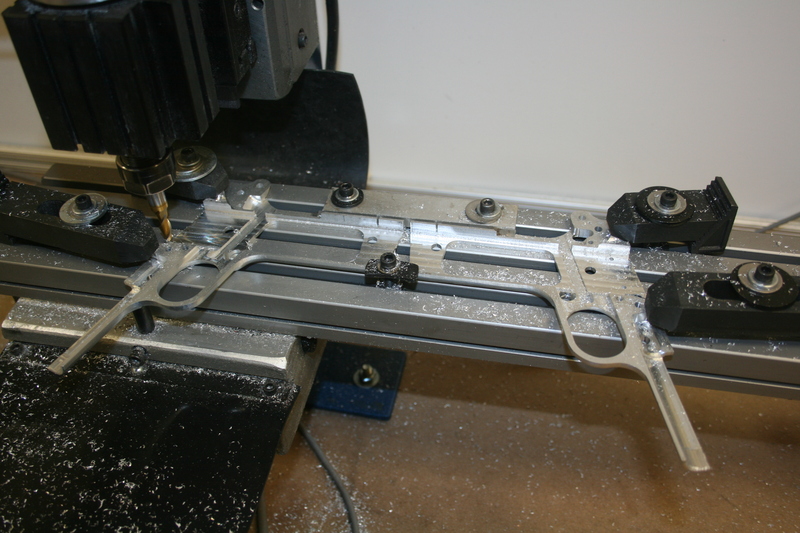 The leaf spring and main spring housing also went in without problems, so now I had a functioning trigger. 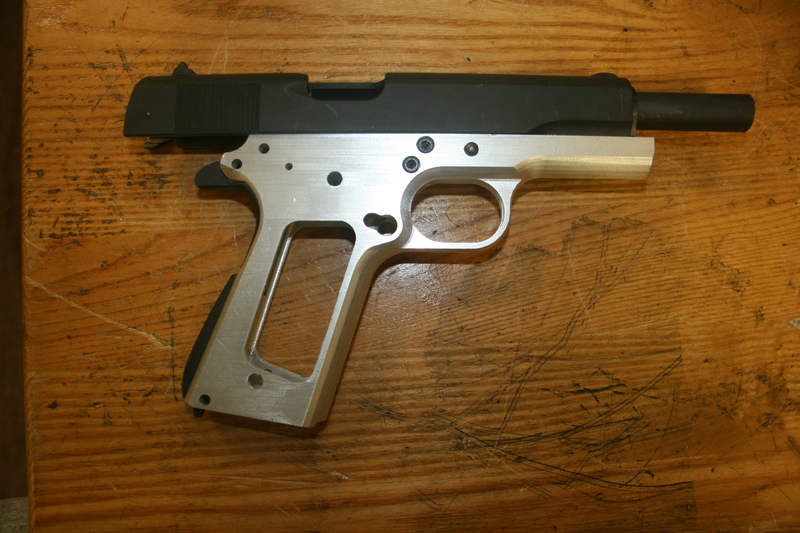 I then tried to fit the thumb and grip safeties and discovered another problem with the CAD model, which I probably would have noticed earlier if I had ever assembled a 1911 before. The hole for the thumb safety doesn’t go all the way through the frame like it should. So back on the mill to drill out the hole. I also had to use a hand file to widen the hole where the thumb safety interacts with the hammer and trigger. Then I discovered with the full fire control group installed the slide won’t go all the way back. Next was tapping the holes for the grip screw inserts, which of course had to be some oddball-sized tap that I didn’t have, so I had to order a tap. The grips themselves and the plunger tube fit with no issues. 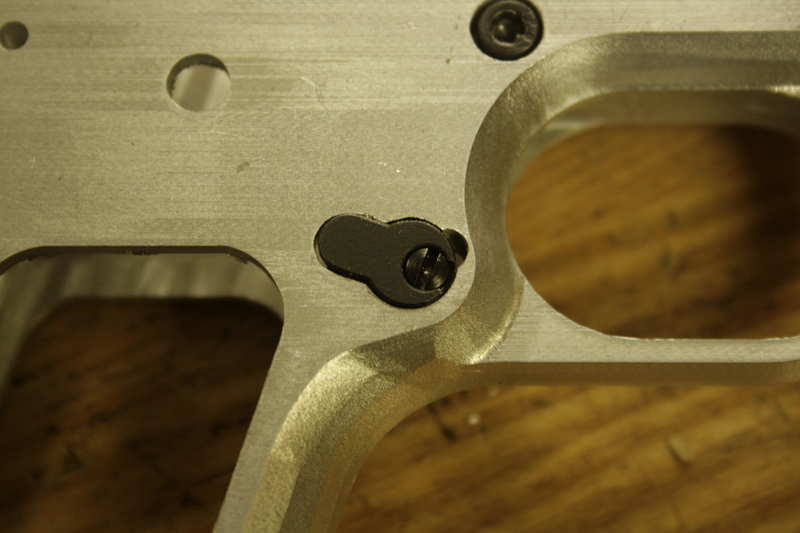 The last piece that needed to be attached to the frame was the ejector. Here, I discovered a third problem with the CAD model. One of the holes for the ejector was only half as deep as it should be. So back on the mill one more time. 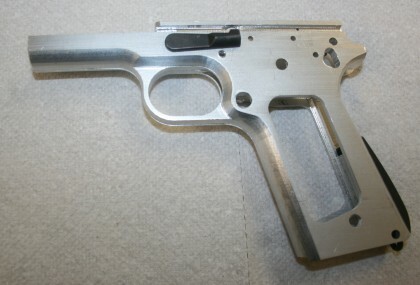 Now, with the ejector attached to the frame, the firing pin and extractor installed in the slide, and the slide and barrel back on the frame, I have a completed firearm. Everything seems to function correctly, and the headspace looks good. (I don’t need to buy a chamber reamer. Yay!) All that’s left to do is to decide how I want to “permanently” join the two frame halves. Currently, they are held together by just two bolts near the center of the frame. My original plan was to use an aluminum brazing rod to weld the two halves together, but looking at the finished frame I think if I add one more bolt in the top front of the trigger guard, and use a bolt instead of a pin to hold in the main spring housing it would work fine without welding. 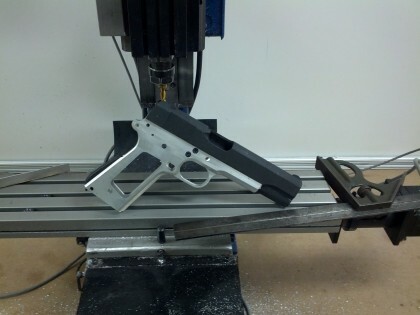 Why the CNC 1911 Isn’t Finished, or Rebuilding a DeLorean Engine. … which is pretty much how it looked four months ago. 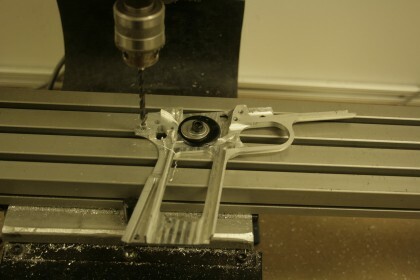 It still needs a fair bit of machining in order to get all the parts to fit. The problem is what little time I have for hobbies has been taking up by other things. First I decided to paint my basement, and before that got finished, I discovered my car had a head gasket leak. Unfortunately, because of the type of engine, its age, and high mileage, it makes more sense to do an engine swap or full rebuild than to just replace the head gaskets. The main problem is that the engine has paper seals at the bottom of the cylinder liners, and there is a good change they will break when you remove the cylinder heads, which you may not know until you put everything back together and run the engine. If they break, to replace them, you have to pull the engine and remove the pistons. If you’re going that far you might as well do a full rebuild. You may recognize the platform. Jason informs me that there’s still a lot of work to be done, as everything is not fitting together all that nicely at the moment. The first attempt was sacrificed to the gods of gravity, and a loose fitting. 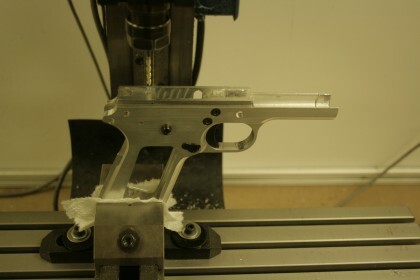 I guess it’s a good thing aluminum is fairly recyclable, and 1911s aren’t made out of the bones of endangered species, or something. Quite a lot of aluminum has been gone through on these projects that’s been sacrificed to FAIL. 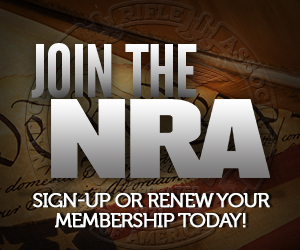 But he’ll have a nice collection of homemade guns when all is said and done, for sure. 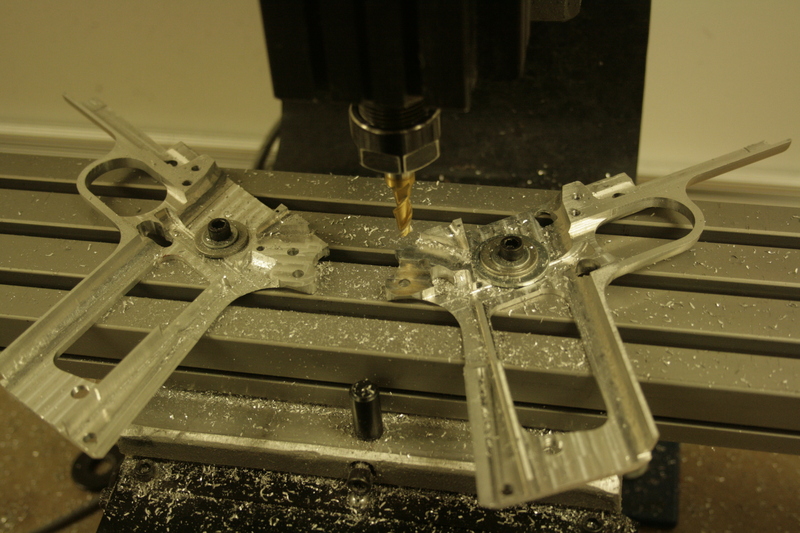 I believe this is a frame that bolts together, which makes it easier to do on the mill.